Sarah Bailey’s debut Australian crime novel The Dark Lake opens strongly. The body of a popular teacher is found by an early morning jogger in the town lake, surrounded by long stemmed red roses. The teacher is Rosalind Ryan, daughter of wealthy family of developers, who left town but had returned a couple of years before under cloud. Detective Gemma Woodstock is called to the scene. She comes across very quickly as on edge and conflicted both about the case and her life. Gemma went to school with the victim and knows her better than the casual acquaintance than she makes it sound, although the full details of their connection do not emerge until much later. The Dark Lake falls into the crime sub-genre of police procedural run by a too-invested, damaged cop. Gemma Woodstock is a fairly unlikeable but not uninteresting protagonist. Woodstock has lived in the small town of Smithson all her life and has a young child but is also having an affair with her work partner Felix, who himself has a wife and three daughters. So from the start she is juggling a complicated personal life with potential unearthing of deeper secrets and trauma from her past. As is the norm in this sub-genre, Woodstock does not reveal her potential connection to the victim and even when she receives a threatening package potentially from the killer she does not tell her superiors, worried she will be (rightly) taken off the case. That said, this is also a meticulous procedural with a good feel for the investigative process and politics behind it. Bailey follows Woodstock and her team through the investigation, unearthing a number of suspects and plenty of mystery. And the team come across as competent even when stumped by the number of strands in this case. A key in the procedural genre is the maintenance of interest or tension through the ups and downs of an investigation. It is one of the reasons why these novels tend to be on the shorter side. Unfortunately, Bailey spins the whole investigation out for too long so that from about half way point it starts to run out of puff. She does manage to keep some tension with additional personal jeopardy for Woodstock and the slow reveal of her personal history with the victim but by that time interest is starting to wane. The pacing is not helped by the inclusion of random, third person point of view chapters from minor characters which add little to the overall plot and who disappear as quickly as they are introduced. 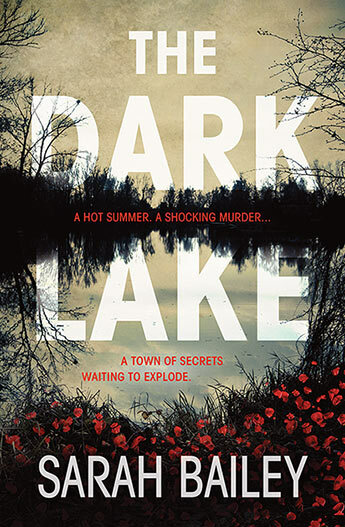 The Dark Lake is set in the fictional regional town of Smithson is four hours from Sydney and home to a giant canning factory which is the big employer in town. This is a place where many of the locals have deep roots and everyone knows everyone else. But it is difficult to get a real sense of the place. The narrative itself never strays from the urban, focussing on the local school close to the lake, where both the Emma and Rosalind were students. There is little consequence of the novel being set in this town and it could easily have been set in an outer suburb of any Australian suburban centre. All that said, Sarah Bailey has delivered a solid debut. She creates an engaging and well plotted mystery with plenty of suspects and red herrings. While the setting comes across as a little generic, it is refreshing to see Australian crime authors set their action in Australia and avoiding the need to Americanise. Bailey is part of a vanguard of new, female Australian crime authors, and a signal that the Australian crime scene continues to flourish.